There's nothing like a nice lunch to break up your daily routine. For many, a good workplace not only means having an awesome boss and coworkers or an easy commute, there also needs to be a plethora of solid lunch options. 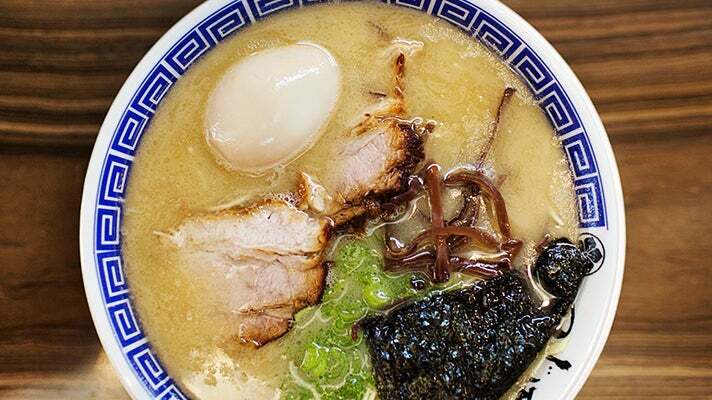 In the West L.A. area, the stretch of Sawtelle Boulevard between Santa Monica and Olympic known as Sawtelle Japantown is an amazing "lunch time cafeteria" devoid of corporate, strip-mall restaurants. And if you're into Asian food, the 2 p.m. post-lunch food coma that follows will be completely worth it. Here are some places we enjoy in Sawtelle Japantown. In Hawaii, there's shaved ice. In Taiwan, there's that, too, but they've taken shaved ice to another level by making the ice blocks... with actual ice cream! Choose from ice cream flavors such as strawberry, green tea and black sesame and choose from a plethora of toppings. 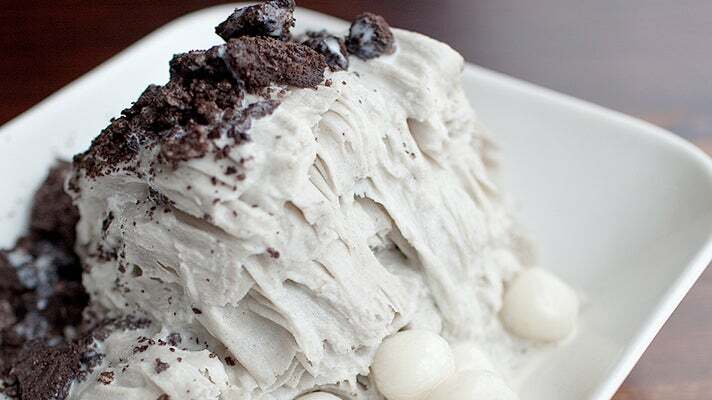 I always get the black sesame with crushed Oreos – completely addicting. 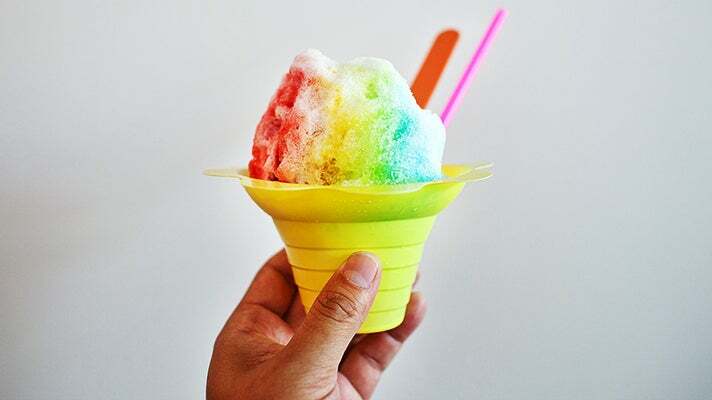 Ask anyone who's been to Honolulu, Hawaii, and they're sure to talk about the tasty Hawaiian shaved ice shacks such as Waiola's or Matsumoto's. An ice block is shaved down and packed into a cup. From there, you let the staff know what syrup flavors and add-ons you like. The most popular shaved ice is the Rainbow shaved ice with a scoop of Dole's pineapple ice cream. It's the perfect treat for those that miss Hawaii. For chicken wing fans, you'll be happy with most of their under $10 plates. 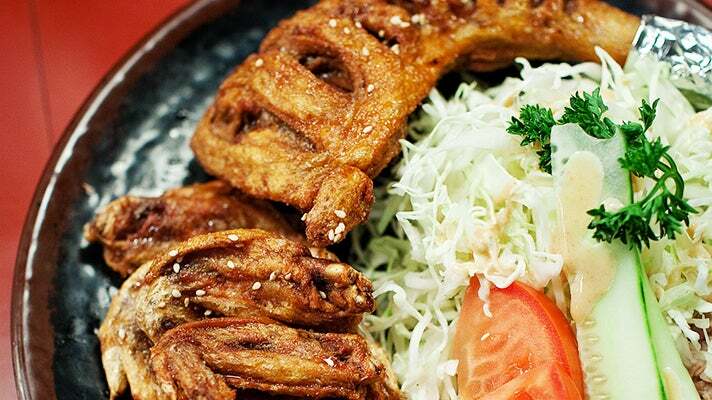 These chicken wings are first marinated, then deep fried and glazed with Furaibo's tasty sauce. This place gets packed during lunch so it'll be best to go here before noon or shortly before 2 p.m. The wings are very addicting. 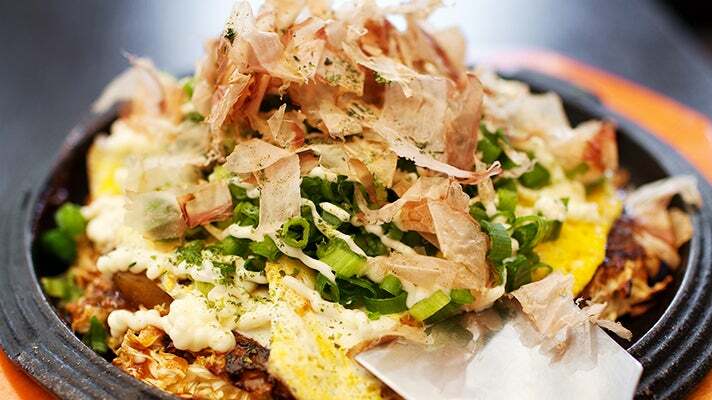 This Osaka-style restaurant serves one of Japan's most loved snacks, okonomiyaki. Some refer to it as Japan's "pizza." A special batter containing your choice of shrimp, octopus and pork is prepared on a teppanyaki grill and browned on both sides. But the party is just beginning as the chef adds your choice of toppings such as Japanese mayonnaise, bonito fish flakes, scallions and a special teriyaki-like sauce. Usually okonomiyaki is made for two to three people to share, but at Gottsui, they offer a "personal pan" size that's easily manageable during lunch. Add a crisp beer to make this one complete happy meal. The Westside, in addition to the great selection of ramen and yakitori, offers excellent sushi. Maybe even better than the South Bay (Gardena and Torrance) area. 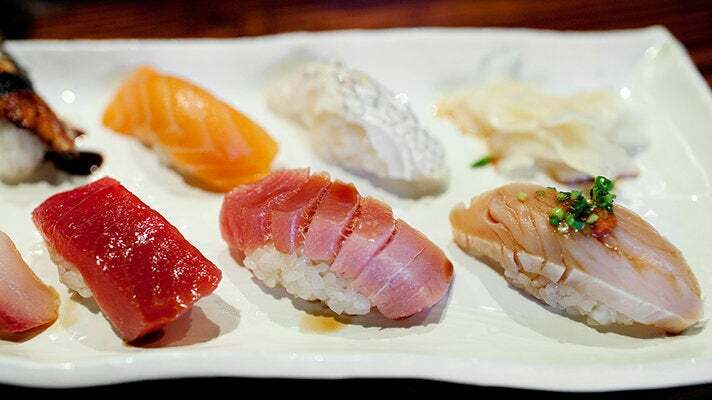 My go-to is Ken Namba's Sushi Kiriko because of their awesome $24 deluxe sushi combo, which includes Namba's excellent house-smoked salmon, and believe it or not, a piece of fatty toro. The fish is extremely fresh and you may find yourself coming back here for sushi in the evening. Finding decent pho on the Westside is somewhat of a conundrum, but thanks to the Phuong family, that problem has been eradicated. 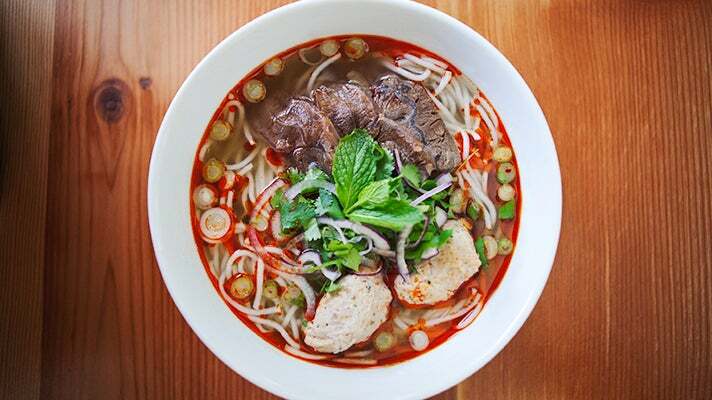 Hailing from Saigon, Mama Phan adds the most important ingredient to her bowls of pho, a mother's love. Her beef and chicken pho are MSG-free and complete with soul. You'll find yourself drinking every last drop of broth. The lemongrass pork bun noodles and passion fruit tea are also something not to be missed. If you can handle a burger before that important 2 p.m. client meeting, Plan Check welcomes you with open arms. 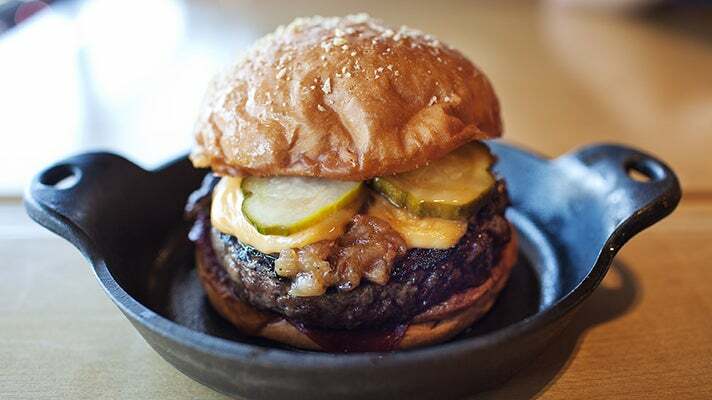 Fans of Umami Burger may recognize the creative toppings and maximum beef flavor because the menu was created by former chef Ernesto Uchimura. Add some sweet potato waffle fries or even a fried egg to the burger for the ultimate supersize. The cocktail list, created by Pablo Moix and Steve Livigni (formerly of Pour Vous/La Descarga/Harvard & Stone), is also quite juicy. The ramen here by Takeshi Tsujita is easily the hottest ramenya (ramen shop) on Sawtelle. He serves two types of ramen: one with soup and one with a dipping sauce (tsukemen) only during lunch, and you will find yourself waiting at least 20 to 30 minutes at times. The ramen broth here is milky and flavorful, a product of more than 15 hours of boiling pork bones until it is milky white. The tsukemen, although soup-less, has an amazing dipping sauce that is heavy on the bonito fish flavor, if you enjoy that. Why Tsujita-san doesn't serve this during the evening baffles me, so make sure you only go during lunch if you crave ramen.